My obsession with CNC machines began a few years ago with my first Arduino shield – The Adafruit Motor Shield. After assembling the kit, my first real soldering project, I was amazed by the ease and precision with which stepper motors could be controlled. With a bit of free time on my hands, I spent a week or so searching out disparate parts to cobble together a haphazard single axis motor and control system. Watching my crude platform creep back and forth along a wobbly threaded rod was absurdly satisfying and I knew building a full CNC machine was in my future. Free time quickly succumbed to work and left my CNC aspirations simmering on the back burner. During late night browsing I would scour Instructables and MAKE for CNC projects, filing away bits of information. My original intent was to build a machine of my own design from scratch, but I quickly realized the complexities were beyond my abilities at the time. 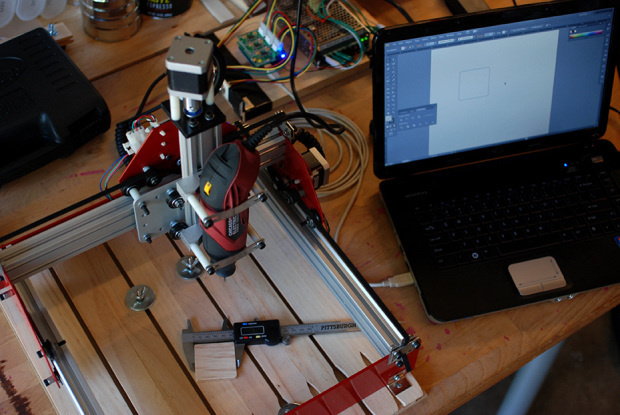 I began to research CNC kits and was inspired by Edward Ford’s Shapeoko Kickstarter project. Despite being reluctant to invest in the initial wooden version, I was very excited to see Shapeoko evolve into a substantial machine of metal and aluminum with the help of Makerslide, another Kickstarter project. Sometime after I came across Shapeoko and immediately placed an order for a Mechanical Kit, the barebones machine without electronics. I spent the next month sourcing various components, some of which I already had, and reading the extensive Shapeoko build wiki and user forum in advance of receiving my kit.